What are Auto Tags? Auto Tags are another name for what most people call License Plates or Car Tags. 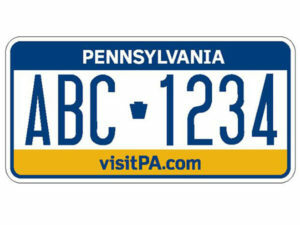 To legally drive a car in Pennsylvania you must have a valid registered Auto Tag plate. If you need auto tags in philly or bucks county auto tags we are your tag place! What is a Title Transfer? A Title is a legal document that shows ownership of a vehicle. In order to buy or sell a used car you must bring the Auto Title in to an Auto Tag Agency and sign it over from the seller to the buyer. Once that is done we send it up to Penndot where they record the transaction. Will I get a new license plate (auto tag) when I buy the car (transfer the title)? Yes! We can give you a new Auto Tag and Registration right then and there so you can legally drive the car immediately. Transferring the title of your vehicle can be a time consuming process. Here at Frank Van’s Auto Tags we strive to make this title transfer process quick and easy so that it is hassle free. with our help, you save your valuable time. All we need is the Title and the buyer’s valid drivers license and proof of insurance. Don’t have insurance? No problem- we work with an insurance broker who can get you legal for less. For your convenience, once the documents are completed we send them up to Harrisburg with our messenger who will hand deliver the paperwork on your behalf. This process usually takes Harrisburg 3-4 weeks. Need the title back sooner? For your added convenience we offer Online vehicle title transfers which will accelerate this process, taking 5-7 business days for a small additional fee. Convenient Hours: We are open late in Philadelphia for Auto Tags, Title Transfers, and Registration Renewals and we are one of the few Philadelphia Auto Tag places open on Sunday. Open Sundays 12-4: We are one of the few Auto Tag Places open on Sundays in Philadelphia that doesn’t require any appointment!